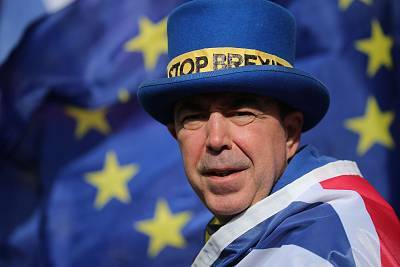 LONDON — Steve Bray stands outside Parliament from morning to night wearing a blue top hat adorned with a yellow ribbon reading "Stop Brexit." He's now one of the most recognizable protesters against the United Kingdom's departure from the European Union. Known for photo-bombing media shots with signs and a bullhorn, he's become a minor celebrity. Passersby recognize him from television and regularly ask to shake his hand or to pose for selfies. "Stop Brexit!" Bray screams into the air at regular intervals. "Leave means leave!" counter the pro-Brexit protesters across the street, holding chest-high red and white signs. 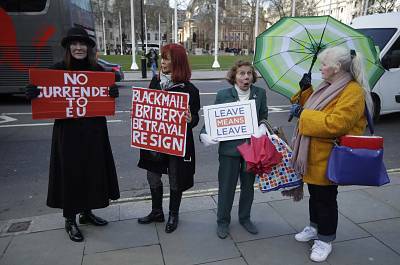 Months of chaos over Brexit have revealed the deep differences that divide British society, and have inspired a clutch of protesters to stand in front of the Palace of Westminster day in and day out — whistling and cheering. It can sometimes feel like a party is going on, and not a painful and profound political realignment. Friday was supposed to be a historic moment — the day the U.K. was supposed to leave Europe. But chaos has engulfed the process and the final exit date has been postponed. The day instead will see a number of mainly pro-Brexit marches and events in London. On Saturday, hundreds of thousands of protesters crowded the streets of London pushing for a second referendum in one of the largest mass demonstrations ever held in the capital. But these protesters are largely part-time warriors compared to the regular activists who show up every day that Parliament sits. They all have two goals — to influence lawmakers and encourage fellow countrymen to stand up for their beliefs. For at least one member of Parliament, their presence is welcome. Phillip Lee quit his ministerial post last spring after objecting to his ruling Conservative Party's handling of Brexit. "I resigned into a void, and having people like them there gives you a feeling of camaraderie. It can get tense, but I'm all for it on both sides," he said as he walked through the protesters on his way back into the Houses of Parliament. "This is a sign of a healthy democracy that people are able and willing to protest." One thing that unites protesters from both sides is their belief that Prime Minister Theresa May has handled Brexit very badly. In December, she and the bloc agreed to a divorce deal that included a transition period so they could hash out a future trade deal. But lawmakers crushed her withdrawal agreement twice, leading to May asking the E.U. for an extension to the March 29 Brexit date. Now the U.K. is scheduled to leave April 12, yet there is still no agreement in Parliament on how that exit will look. And on Wednesday, May told members of her party that she was prepared to step down if they voted to support her contentious Brexit deal. Just hours after the prime minister's offer, the Democratic Unionist Party, whose members have acted as kingmakers for the minority government, signaled they would not support the agreement. With so much disagreement between lawmakers, many of the leave protesters worry that the U.K. will end up remaining in the E.U. Carol Comey has stood outside Parliament demanding to leave five times since December. "I'm totally consumed by it. I'm on Twitter all the time. I watch the Parliament channel every day," Comey, 53, a homemaker, said. "If Brexit doesn't go through I would consider leafleting and civil disobedience like blocking roads." Comey said she wants the U.K. to be sovereign and independent, and believes that it should be making its own laws rather than taking legislation from Brussels. On Friday, Comey, along with other leavers, plans to join the March to Leave rally, pushing for an immediate end to the U.K.'s membership in the 28-member bloc. She will be joined by Eleanor Dobson, 55, a substitute teacher who is also eager for the U.K. to leave the E.U. even if it doesn't have a divorce agreement or agreement on future trade — a scenario that experts warn would sharply harm the U.K. economy. 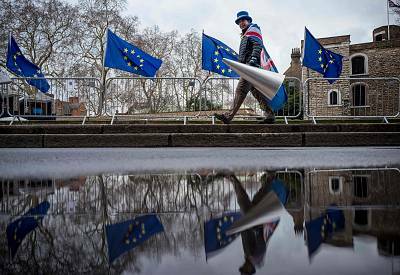 Dobson comes to Parliament at least once a week to protest, and plans to walk with the pro-Brexit March to Leave demonstration on several legs of the journey as it winds its way through England to London. "Remaining in the E.U. is better than May's deal," said Dobson, who said that every day she spends protesting is a day that she doesn't earn money. "I am so fed up with the government." On his end, Bray, who works as a coin dealer in south Wales when not standing outside Parliament, has no plans to leave his post outside the Palace of Westminster anytime soon. He pays for his expenses along with those of eight fellow pro-remain protesters on money he's raised through his website, though he wouldn't disclose how much that was. "We can stand up to this. We don't have to accept Brexit," he said. "We can make a stand. Our presence here encourages others to come out."